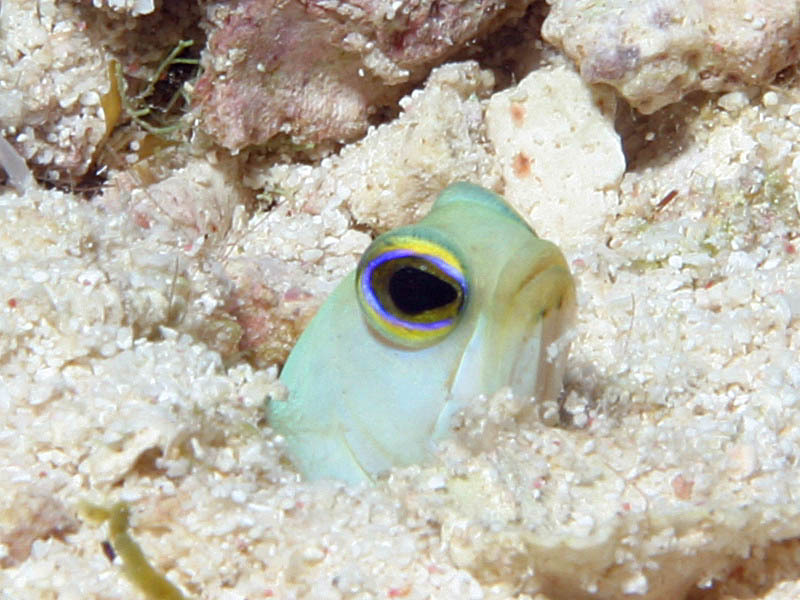 Yellowheaded Jawfish are shy. They live in holes they dig in the sand at the bottom of the ocean near the reef. Because they live in one place and never swim very far from their homes, this makes these little fish cautious. It is hard to get close to them without them disappearing down into their holes. I saw this little fish as I was swimming above the sand. Its movement caught my eye. I saw it just before it disappeared down into its hole. So, I swam away a short distance and waited for the fish to come back out of its hole. Sure enough, after a little while I saw its head stick out so it could look around and see what was going on. That's when I took this picture. This adult Yellowheaded Jawfish was about 3 inches long and maybe 1/2 inch across. ReefNews President Jonathan Dowell took this picture using a Canon 10D digital camera with a Canon 28-105 mm zoom lens in an Ikelite housing with an Ikelite strobe. Copyright © 2005, ReefNews, Inc.